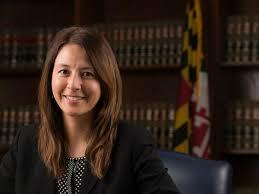 My entire prosecutorial career spanning over 2 decades has been with the Howard County State’s Attorney’s Office. I have grown through the ranks and established myself as a professional, ethical and respected prosecutor, leader and mentor in the community. In addition, I have already established and fostered partnerships with other agencies to ensure that the State’s Attorney’s Office plays a key role in public safety for our citizens. There is no other more qualified candidate for this position here in Howard County. I don’t have a political role model. However, I admire Justices Sandra Day O’Connor and Ruth Bader Ginsburg for their accomplishments on behalf of women in the field of law. Continue working on collaborative efforts in and outside of the courtroom to combat human trafficking, drug trafficking and drug addiction issues. Aggressively prosecute repeat violent offenders and those that prey on our children and vulnerable adults. The number of overdoses occurring among all ages and areas of the county. Public safety is paramount to our livelihood. Howard County is known for being #1 in schools, libraries, parks – this could not happen without the partnerships among our public safety agencies. The State’s Attorney should play a pivotal role in keeping our community safe.